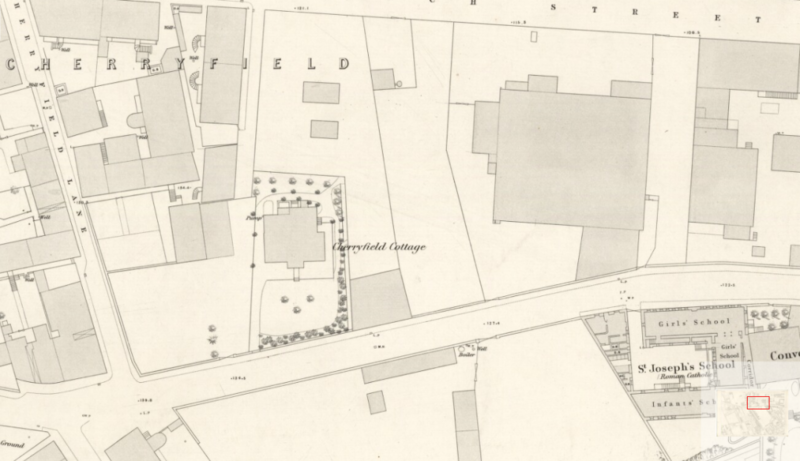 John Caird became a master builder and contractor, operating from Blinshall Street in Dundee. By 1864, he was joined in business by his sons George and William. He claimed responsibility for having built a number of Dundee's flax and jute mills. Unknown with certainty - children William and Margaret were married according to the forms of the Church of Scotland: their sister Jeannie according to the Independent Church. Subscriber 206 – David Scrimgeour – a named trustee and executor in John Caird’s will. Subscriber 210 – Francis Stevenson (brother and partner of John Stevenson) – a named trustee and executor in John Caird’s will. John Caird was listed in the 1841 census as a 'mason,' living at that time in Dudhope Crescent, Dundee. The 1851 census gave a similar indication - as a 'jobbing' mason. His name did not appear in the Dundee Directory until that of 1856-57, when he was listed as a 'builder,' operating from Miln Street. 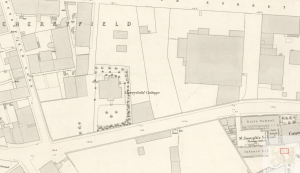 By 1858-59, he had further developed the scope of his business and was then described as 'builder and contractor' in Douglas Street (same locale). By the mid 1860s he had been joined in business by his sons George and William and the business had moved to Blinshall Street. John Caird was born to Francis Caird, a weaver, and his wife Helen Scott, at Tillyhight (sometimes Tillyheight) in the parish of Carmyllie. Carmyllie contained the largest and oldest stone quarries in the country and John Caird lived a mere stone’s throw from them. 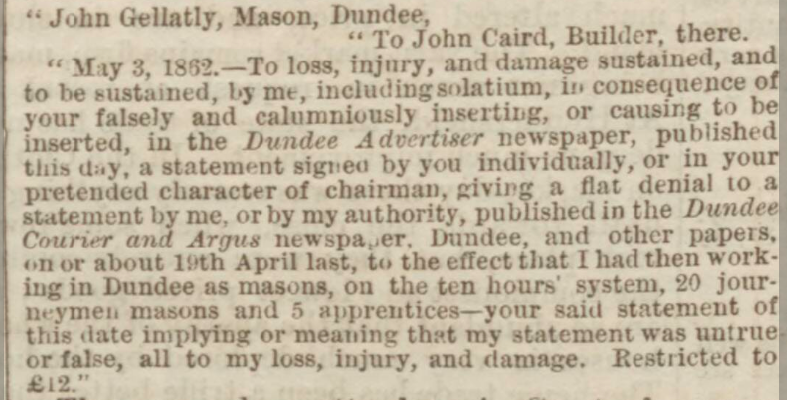 By the late 1830s, John Caird, a man in his thirties, was working as a mason in Dundee (evidenced from his son’s birth record) at a time when the town was fast expanding. It can be assumed, that at that time, he was an employee, as the first listing in the Directory on his own account did not appear until much later, in 1856-57. This proved to be a decade of expansion, development and activity. John must surely have been held in some regard among his contemporaries in the trade, as he was subsequently called upon to address them, at a social event held afterwards, regarding the new fangled invention. It was believed that a number of the stones which had been cut by this machine were then being used in the erection of Messrs Don Brothers, Buist & Co’s new building in Lindsay Street and of Messrs Smith & Sons new buildings in Panmure Street. This was also a decade which indicated that ‘John Caird & Sons’ was a flourishing business. Valuation Rolls of 1865 afforded an indication that John Caird had become the proprietor of a number of shops and dwelling houses in Hawkhill and Balfour Street. He also tenanted and operated the quarry at Rosemill on the Northern outskirts of the town. Apart from the construction of conventional buildings eg – John Caird himself declared that he had been responsible for building both Gilroy’s mill and Grimond’s mill – a more unusual contract for his firm was for the construction of an amphitheatre for (Messrs) ‘Sangers’ Circus.’ This undertaking took place in the latter part of 1865. According to newspaper reports, it was to be the ‘largest building in town and would hold the very large number of 2500 persons. By comparison, the Kinnaird Hall is only seated for 1300 persons. The erection has been carried on with great energy by the contractors, Messrs John Caird & Sons, whose well known reputation is a guarantee that the work is done in the most workmanlike manner.’ A notable feature of the amphitheatre was that it was constructed, not in stone, but in wood. Its location to the South of the Craigie Yard flax warehouses (East Dock Street), roused the trepidation and concern of a number of prominent merchants. They feared that that the proximity of the circus could result in a destructive conflagration of their wares – perhaps due to the miscreants and malcontents who might have been attracted to the locality of the exotic entertainment. 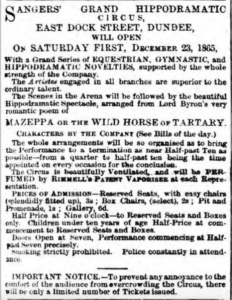 Their concerns were rebuffed by the Police Commission, who claimed that ‘most warehouse fires started from within – not without.’ So it was that ‘Sangers’ Grand Hippodramatic Circus’ also took account of the townsmen’s fears by advertising that ‘smoking was strictly prohibited and that police would constantly be in attention.’Let that be a warning. By the close of the decade, ‘Messrs John Caird & Sons’ was dissolved – his son William became quarry master and builder, operating from Yeaman Shore and Rosemill; son David became a partner of ‘Smith & Caird’ and son George departed Dundee for England. Having retired from an active working life, John Caird continued his life at Viewbank Cottage (the name applied to two, neat, one storey cottages, situated on the South side of the Blackness Road – to the West of Blackness House). John Caird survived only a few more years, having made his indelible mark, in stone (and wood), on the streets of Dundee. Old Parish Register. Carmyllie. Births. (1805). 276/10 396. ScotlandsPeople website. Statutory Registers. Dundee. Deaths. (1873). 282/1 498. ScotlandsPeople website. 1871 Census Scotland. Dundee. ED: 20; Page: 23; Line: 18; Roll: CSSCT1871_49. Ancestry website. Dundee Postal Directory, 1861-62. p.122. Dundee Central Library, Local Studies. Dundee Postal Directory, 1864-65. p.103. Dundee Central Library, Local Studies. Census Records. Dundee. (1861). 282/ 2 37/ 3. ScotlandsPeople website. Dundee Postal Directory, 1869-70. p.107. Dundee Central Library, Local Studies. Statutory Registers. Caputh. Marriages. (1864). 337. 1. ScotlandsPeople website. Statutory Registers. Dundee. Marriages. (1864). 282/ 2 353. ScotlandsPeople website. Alloa Advertiser. 2 July 1864. p.4. Findmypast website. Dundee Courier, 9 June 1868. p.4. Findmypast website. Valuation Roll. Dundee Burgh. (1855). p.97. VR009800001-/97. ScotlandsPeople website. Legal Records. Wills and Testaments. Dundee Sheriff Court. (1874). SC45/ 31/ 24. ScotlandsPeople website. Dundee Postal Directory, 1858-59. p.112. Dundee Central Library, Local studies. Groome, Francis H. (circa 1895 - new edition). Ordnance Gazeteer of Scotland. Volume 1. London. William McKenzie. Warden, Alexander J. (1882). Angus or Forfarshire - The Land and People. Volume III. Dundee. Charles Alexander & Co.
Matthew, David. (2008). Stone Getters of Angus - History of the Quarries. Pamphlet. Dundee, Perth & Cupar Advertiser, 2 May 1862. p.7. Findmypast website. 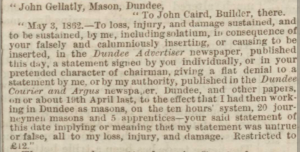 Dundee Advertiser, 14 May 1862. p.4. Findmypast website. Dundee Advertiser, 4 July 1866. p.3. Findmypast website. Valuation Roll. Dundee Burgh. (1865). VR0098000015-/140. p.140. ScotlandsPeople website. Ordnance Survey Name Books. (Fife & Kinross). OS1/13/46/18. ScotlandsPlaces website. Fife Herald, 31 August 1865. via www.scottishbrickhistory.co.uk. 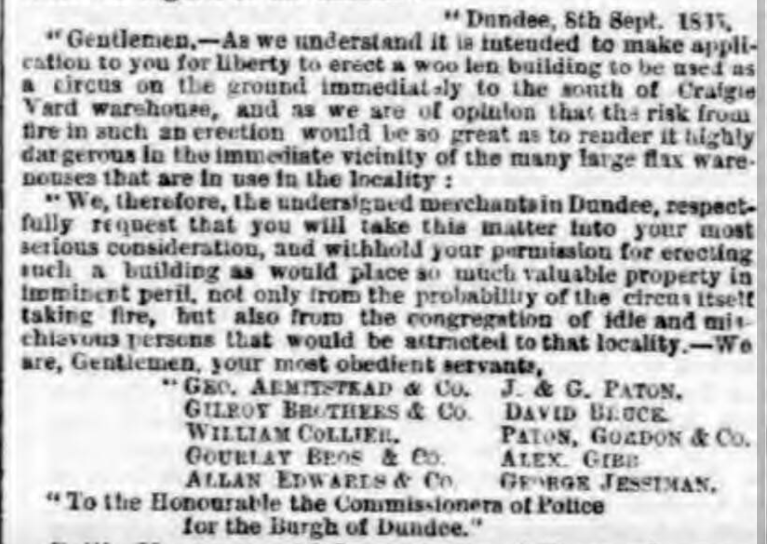 Dundee Advertiser, 5 October 1866. p.4. Findmypast website. Dundee People's Journal, 2 December 1865. p.3. Findmypast website. 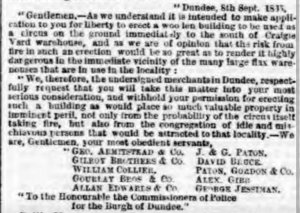 Dundee Advertiser, 15 September 1865. p.5. Findmypast website. Dundee Courier, 19 December 1865. p.1. Findmypast website. 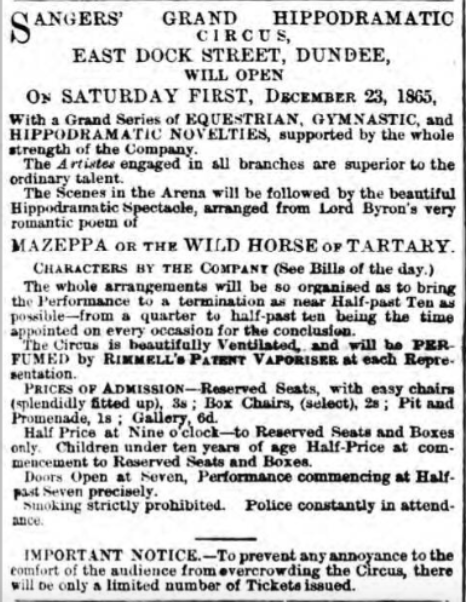 Northern Warder & General Advertiser, 12 March 1869. p.1. Findmypast website. Ordnance Survey Name Books. Forfarshire (Angus). 1857-1861. Volume 32. OS1/14/32/2. 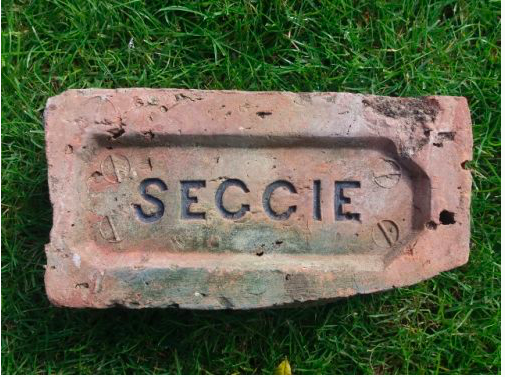 ScotlandsPlaces website. The information above about John Caird has been collated from a range of digital and hard copy sources. To the best of our knowledge it is correct but if you are relying on any information from our website for the purpose of your own research we would advise you to follow up the sources to your own satisfaction. If you are aware of an inaccuracy in our text please do not hesitate to notify us through our Contact page.